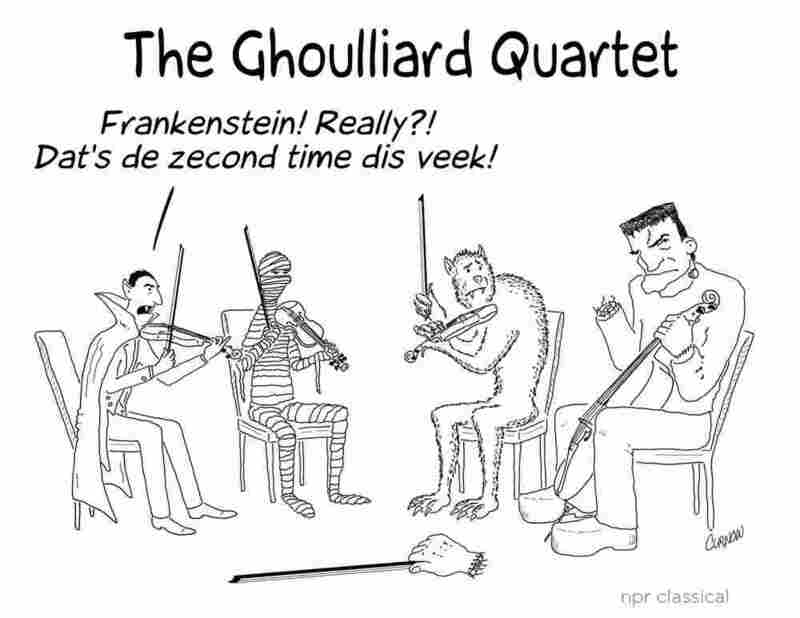 A Teasing Trumpeter: Jeffrey Curnow's Cartoons : Deceptive Cadence In the Philadelphia Orchestra trumpeter's slightly twisted world, bears play bass trombones, Liszt has a brother named Bukhett and snowblowers can be filed as musical instrument deductions. Jeffrey Curnow has a serious funny bone. In his cartoons, he pokes fun at symphony orchestras, conductors and musicians from his perch as the associate principal trumpeter of the Philadelphia Orchestra. Watch for Curnow's off-kilter perspectives on NPR Classical's Twitter and Facebook feeds. He joins our cartoonist emeritus, Pablo Helguera, in our longstanding tradition of posting a little something to make us smile each Friday. Curnow came to the Philadelphia Orchestra in 2001 after a six-year stint as the Dallas Symphony's principal trumpeter. It's safe to say he's got the instrument in his blood: Both his father and grandfather played the trumpet. "It was either playing the trumpet or changing my surname," Curnow says. He also had an uncle who played the trumpet, and another who played trombone in the Stan Kenton band. Cartoons also came naturally to Curnow. He's been drawing as long as he can remember. "I'd spend my weekends with a couple of cousins who were also into cartooning and we'd create our own comic books," he says. Back then, he imitated the artists in some of his favorite magazines like MAD and Motor City. In Curnow's slightly twisted world, bears play bass trombones, Liszt has a brother named Bukhett and snowblowers can be filed as musical instrument deductions. Curnow has also made a few humorous trumpet-centric videos on Youtube. In one he shows how to construct your own "trumpet cave" in a hotel room. Another features voice-altered confessions and a custom, nitrous oxide-equipped mouthpiece. Symphonies by Mahler, Shostakovich and Bruckner are Curnow's day-to-day challenges. "But there are also composers on the loose today who are writing really tricky, crazy trumpet parts," he says. Still, the toughest of all is Bach. "The Brandenburg Concerto No. 2, without question," Curnow admits. "You need the right mouthpiece, the right trumpet, the right frame of mind and a bottle of antacids."